The market is teeming with options for a DVD player that you can use in your car. The choices can be overwhelming, making it difficult for you to make a decision. With this, read the rest of this Pioneer AVH-X4800BS review and let us have a quick look at one of the top products you have to include on your list. We’ll give you a glimpse of its features, as well as its pros and cons, which will help you to come up with the right decision. To begin with, here are some of the main features that you can find in Pioneer AVH-X4800BS, which will help you to decide if this is the right in-dash DVD receiver for you or if you should look at the other options available. The almost 7-inch display of this DVD receiver is one of its best assets. It is not as vivid and crisp as those that you can find from the higher-end products, but it is pretty much impressive given its price range. It has enhanced touch sensitivity, although there are some people who complained that there are lags at times. The touchscreen also makes it easier to answer calls. You do not need to touch your phone to accept or reject a call. You can do so directly on the touchscreen of the unit. The screen has a WVGA resolution of 800×480. There are five display colors and 112-key colors. To have complete control of how the screen functions, there are features like brightness control and illumination timer. Plus, you will also have the option to customize the display and you can choose from the 13 backgrounds that are available. You can also dim the screen and customize the home screen by putting shortcut buttons. Speaking of answering calls, it is also a good thing that it comes with Bluetooth technology, which will allow you to use it wirelessly. This means that you can use it for hands-free calling and audio streaming. This is going to make your life a lot easier when driving. Not to mention, this will also have a positive impact on your safety as you won’t have to be distracted by holding your phone as you drive. Aside from the Bluetooth, it is also worth noting that it has Wideband Speech Handsfree Profile 1.6, which increases the bandwidth of the frequency by up to two times. This simply means that you can enjoy better call quality as the reception is improved. The Bluetooth feature also makes it possible for drivers to use their voice when controlling the screen, which is one more reason why it lessens the distractions when driving since there is no need to touch the display. Just make sure that the device connected to the receiver has voice recognition capability. To be able to enjoy crisp and clear audio, it is important to have an amplifier in your sound set up. 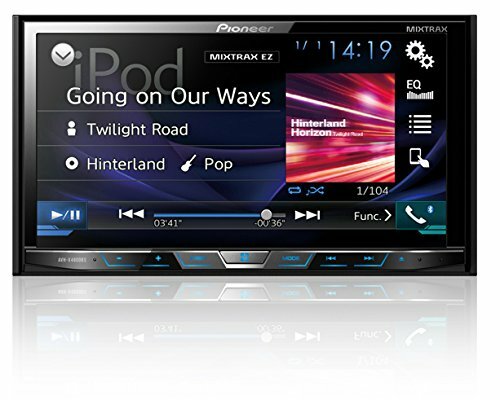 No need to worry as Pioneer AVH-X4800BS is fitted with an internal amp. Regardless of the genre of the music that is being played, you can anticipate that the quality will be exceptional. The 14-watt amp has four channels that can be connected to your speakers, which can also simplify the set-up of your sound system. Many of the in-dash receivers that you can find on the market only have two channels while this model has four. This makes it the perfect upgrade to your speakers. Audiophiles will surely appreciate this. If you are looking for a head unit that is compatible with Android phones, this is one option that should be on the top of your list. As long as you have Android 4.0 or newer, this will work. It has Android Music Support, which will allow you to connect and listen to music from your phone in the absence of having to install a dedicated app. The receiver will also display relevant information about the music that is being played. Meanwhile, it also has USB direct control for your iPhone and iPod. With the use of the required cable, you can instantly connect your Apple device and access your music files. Because of the direct digital signal transfer, sound quality will be better. The best thing is that while music is played, it provides 1 amp of power so that your device will keep on charging. This makes it a better way to play music compared to a Bluetooth connection. This is one technology that has been developed exclusively by Pioneer for your music-listening needs. Whether you are stuck on traffic, bored while driving, or if you are on an epic road trip, Pioneer knows that music is essential. With this, they came up with Mixtrax, which provides a DJ-infused listening experience while you are driving. It makes it possible for tracks to be remixed easily and quickly, without DJ knowledge! There is even a club-style illumination to complete the mood. Indeed, this is a revolution that changes the way you enjoy driving! In line with improved music listening experience, it should also be pointed out that it is SiriusXM-ready, allowing you to enjoy satellite radio while you are driving. Aside from commercial-free music, you will also get traffic and weather updates! However, take note that the tuner needs to be purchased separately. The Pioneer AVH-X4800BS will also make a versatile in-dash receiver as it comes with a wide array of expandability options. Aside from controlling your smartphone using the screen, it also has an input for a rear-view camera, A/V, and USB. There is also a 6-channel pre-amp output. Plus, you can connect a compatible navigation module to provide you with turn-by-turn directions when driving. With a push of a button, the screen can instantly transform into a navigation device. In sum, the Pioneer AVH-X4800BS is indeed a good alternative to the more expensive in-dash receivers. It offers a plethora of features, including Android and Apple compatibility, which will make your driving experience more enjoyable. At its price, it would be safe to say that it is pretty much an impressive choice!